The Coral Pink Sand Dunes State Park is located southeast of Zion National Park between Mount Carmel Junction and Kanab. It rims the Arizona border on the southwest corner of Utah. From Mount Carmel Junction, turn south on Highway 89. Follow the highway for 3 miles to the signed turn-off to the dunes. Continue on this road to the park entrance. If you don't turn here, but continue on the same road the pavement will give-way to dirt and gravel after it leaves Kane County and enters the Arizona border. The road comes out on Highway 389 near the communities of Hildale and Colorado City. Sand dunes occur throughout the world but the Coral Pink Sand Dunes are the only major dune field on the Colorado Plateau. A gap to the south of the park allows winds to funnel eroded sandstone from Moccasion Mountain. The grains of sand are moved through the valley to the park which serves as a reservoir for the quartz crystals to settle. 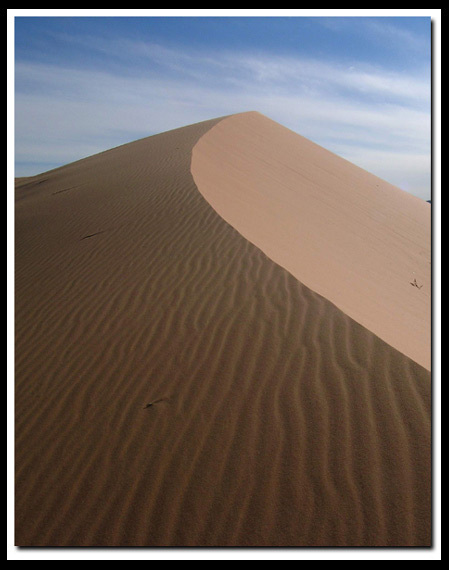 Funneled wind, increases wind velocity to a point where it can pick up and carry sand grains depositing it into different piles, dunes, where layers upon layers of sand stack upon each other. This is called the venturi effect. Moquith Mountain acts as a barrier causing the the wind to die down and the sand to fall where it does. 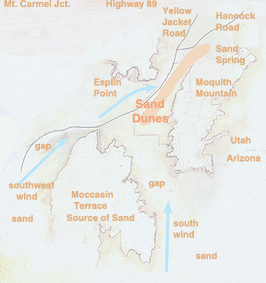 The winds force various types or shapes of dunes to occur at Coral Pink Sand Dunes. The park's two largest dunes lay in front of the boardwalk. The tallest is a star dune, which is 100 ft. tall, the other is a crescent dune which was the first dune to form in the park. Star dunes are isolated, pyramidal with arms radiating from the central high point, something like a pinwheel. A crescent dune (barchans and transverse) is usually wider than it is long and is formed by wind that blows from one direction. This is the most common dune form on the planet. There are a few hikes in and around the dunes including the short trail around the sand. Basically hikers travel from one sign to another. The interpretive material is outstanding, pointing out interesting tidbits about the park. In addition to this short trail, there is a strenuous 5.5 mile, soft sand trail, that begins at the day use area and continues around the edge of the dunes. While at the state park, wander over to South Fork Indian Canyon and the Helldive Canyon Pictographs Trails. You will need a OHV to take the scenic road out to the trailheads, but from there it's a nice hike to outstanding and ancient rock art. The baby foot prints on the roof of the Helldive Alcove are a favorite. Diana's Throne is another fun place to explore when at the dunes. The tale goes that Diana was so awed by the view from the throne that she jumped and died. The Coral Pink Sand Dunes State Park is located southeast of Zion National Park between Mount Carmel Junction and Kanab. A ponderosa pine forest borders the dunes making the landscape of the park unique. Old-growth ponderosa thrives in the environment which is unique since it is the only major dunes that support the trees. Ponderosa usually grow where there is more moisture and a higher elevation. Above 6,900 ft. is where the ponderosa flourish at the park. Rain and water from melted snow collect beneath the surface of the sand to be used by the trees.